The Passamaquoddy indians called it Mun-a-Nook or "island place". Situated some 22 miles from Blacks Harbour, being 15 miles long and 6 1/2 miles at its widest point. Master John Rut who sailed from Bristol England, on the "Mary of Gilford" in 1527 during the reign of Henry the Eight, was the first Englishman who visited this part of the country. In 1606 Champlain spent a stormy nights off Southern Head and wrote about it in his "Voyageurs" which was published in Paris in 1613. In 1621 the territory now comprising New Brunswick and Nova Scotia , which included Grand Manan, was granted to Sir William Alexander, by James the First.. In 1667, this territory was reverted to the French by the treaty of Breda and a grant of the Island was made to Paul Dailleboust on Apr. 16/1693 by the Gov. of New France. Because Paul never lived on the island or place settlers there , his grant title lapsed back to the Crown. The first survey of the island was carried out in 1734 by George Mitchell, Deputy Surveyor of Crown Lands of Nova Scotia.. 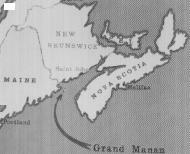 In 1773 a few people tried to get their hands on Grand Manan but didnt succeed. In 1779 Joel Bonny, Abiel Sprague and James Sprague (brothers to Mrs Bonny) and their families left Machias (machias in the usa not machias seal island) and moved to Grand Manan, they lived in huts in Bonny Brook, which runs into Grand Harbour. In 1779 the Merrisheete, Penobscot and Passamaquoddy tribes made a complaint against the settlers who had taken possession of Grand Manan. A letter was sent to Bonny , Bonny returned to Machias with his friends, held a meeting with the Indians and for $10.00 and an animal Bonny and his friends were allowed to pass the winter on the Island. Joel Bonny's first son Alexander was the first white child born on Grand Manan. Alexander became a minister (Baptist) and died in 1869 at age 90 yrs. And the first white female born on the Island was Barbara Cheney in 1787. Joel Bonny moved to Diggedequash (Not far from St George) in 1780 where he made it his home. He was born in Pembroke Mass., he was Welsh, and died in Portland Maine at age 84. In 1775, Johathan Eddy with some Indians from Machias and St John River, attacked Fort Cumberland. They didnt get very far and retreated to Maugerville, through the forest then back to Machias. When he got back to Machias , he made plans to get some land for himself and his followers. In 1783-84 when Loyalist started getting grants for land, Eddy applied to the Gov. of Mass., for possession of Grand Manan Island. In 1784, July, The Mass., Gov., appointed a committee to sell Grand Manan and all the other Islands around it for the most they could get. Moses Gerrish , in charge of the Loyalists settlers, heard of this and had made plans of his own. Dec. 30/1783 The Gov. of Nova Scotia granted a license to Gerrish to occupy the Island, which they took possession of and began a settlement in May 1784. Moses Gerrish who was born in Newbury , Mass., June 10/1744 became the first permanent setttler on Grand Manan NB., he received a magistrate appointment which gave him the rights to perform marriages. One day at age 86 in 1830, he had travelled to Seal Cove from where he lived on Grand Harbour Island (Ross Island) to perform a marriage. On his way back he drowned at Grand Harbour.. Although Gerrish settled on Grand Manan in 1784, the USA refused to let go of their claim to Grand Manan. At the end of the Revolutionary war, the boundary lines were changed and the US laid claim once again to Grand Manan. Great Britain appointed a commission and under the Treaty of Ghent, rendered at New York, Nov. 24/1817 Grand Manan was finally awarded to Great Britain.